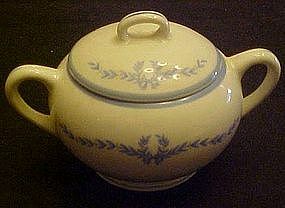 A nice sugar bowl with lid in the blue laurel garland pattern by WS George. Also marked on the bottom is Derwood, which may be the shape or tye of eggshell china used. Measures 4 1/4" tall with lid. Perfect condition with NO cracks or chips.